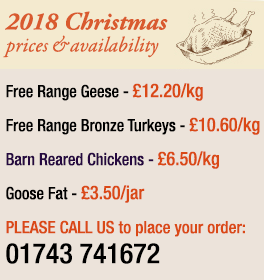 Customer testimonials for Brisbourne Geese Shrewsbury Shropshire - goose for Christmas! "Just a note to say how much I enjoyed the goose I collected at Christmas, the last of which was only eaten yesterday. It was (as usual) the best ever." "We had one of your free-range geese and would just like to say what a delight it was. We had two fine meals from the goose and will definitely be ordering another for next Christmas." "I just wanted to thank you whilst I digest a rather wonderful meal of turkey legs and potatoes roasted in Christmas goose fat! The whole family thoroughly enjoyed our Christmas goose which was excellent both on the day and on boxing day. The moment we opened the box we knew we were in for a treat and it certainly lived up to the anticipation that has been building since the geese were first seen out in the field."